This is the segment where I jot down high yield notes for rapid revision of some key features of a focused topic. I know I have not done these for a while now, but well, with the exams right around the corner, and blogging on the backburner, I decided this might be the format to go with for a while! Chromoblastomycosis is a chronic fungal infection of the skin and subcutaneous tissues characterized by the formation of a slowly enlarging lesion caused by the fungi which are usually implanted by micro-trauma like pricking of a thorn. 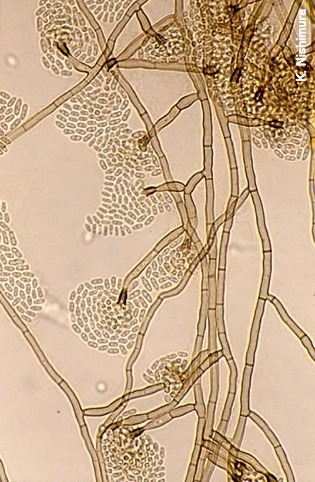 Although this disease has been reported from all over the world, as in the case of most cool infectious disease conditions, this is primarily seen in the tropics and sub-tropics. As it can be easily understood people who spend more time outdoors are more prone to be affected. The highest incidence of the disease is seen in Madagascar, Japan and Brazilian Amazon. Males are more likely to be affected. And the active age group of 20-50 years is especially susceptible. Diabetes and other immunocompromised states are a contributory factor. Wikipedia claims: A correlation with HLA-A29 suggests that genetic factors may play a role as well. 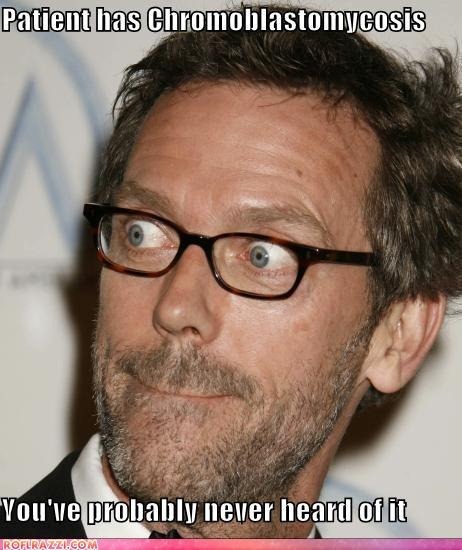 Mortality is rare and morbidity relates to the severity of the disease. The initial trauma is so trivial and often occurs months or years in the past and the patient may not recall the event. The lesions most often develop in the exposed parts of the body and start off as one or multiple small scaly papules, which are usually painless but may cause itching. With time, satellite lesions may develop. The lesions gradually increase in size over a period of months to years and takes on a verrucous appearance. Unlike eumycetoma, these lesions are restricted to the skin and subcutaneous tissues and do not have any extensions into surrounding structures. Prominent pathological changes in the skin include epithelial hyperplasia, fibrosis and microabscess formation. Skin scrapings mounted in 10% KOH and Parker ink solution show characteristic brown pigmented, planate-dividing, rounded sclerotic bodies. 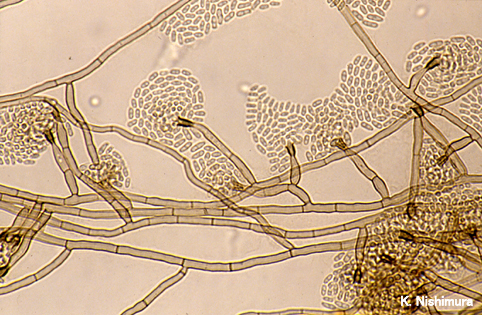 Due to considerable overlapping between diseases caused by other dematiaceous fungi, now, the term chromoblastomycosis is restricted to the cases in which sclerotic cells are present in tissue. 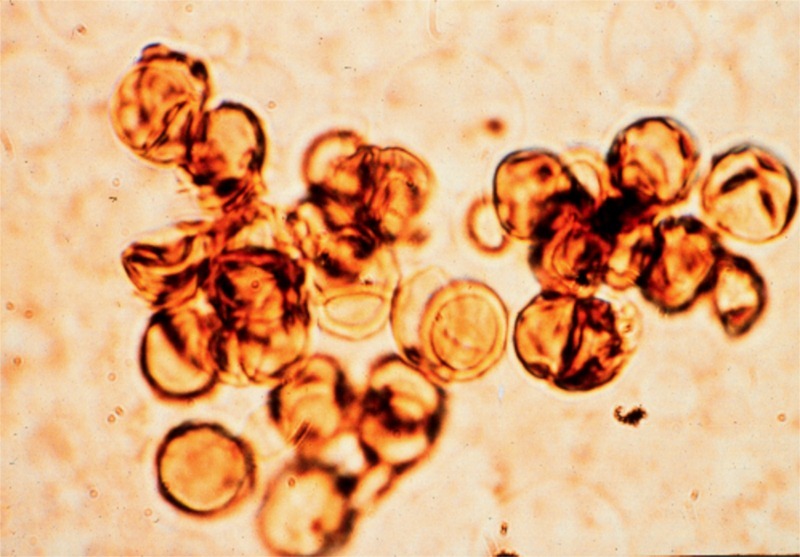 Sclerotic cells, also known as Medlar bodies, are globe-shaped, cigar-colored, thick-walled structures that are 4-12 µm in diameter. The present name of Chromoblastomycosis was adopted in 1992 but the term was coined originally in 1922 by Terra et al. The common complications include bacterial superinfection, lympgedema and ulcerative or necrotic changes in long standing, larger lesions. Rarely, the causative agents may undergo hematogenous or lymphatic spread to other tissues and cause similar changes. 1. Skin scrapings should be examined using 10% KOH and Parker ink or calcofluor white mounts. 2. Tissue sections should be stained using H&E, PAS digest, and Grocott’s methenamine silver (GMS). 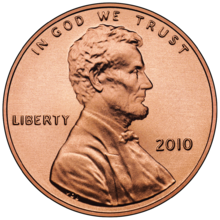 The sclerotic bodies typically show copper penny appearance . 3. Culture may be done on Sabouraud’s Dextrose agar. 4. Serological tests are not available. 1. It is difficult to treat in the very advanced stages but carries a good prognosis when adequately treated early on. 2. Itraconazole, an antifungal azole, is given orally, with or without flucytosine (5-FC). 3. Alternatively, cryosurgery with liquid nitrogen has also been shown to be effective. 4. Other treatment options are the antifungal drug terbinafine, an experimental drug posaconazole, and heat therapy. 5. Antibiotics may be used to treat bacterial superinfections. 6. Amphotericin B has also been used. Tags: Chromoblastomycosis, Clinics, Fungi, MedBlogging, Medicine, Notes, PostADay2011. Bookmark the permalink.